In September 1944 the Hofoku Maru (http://www.wrecksite.eu/wreck.aspx?59634), one of infamous Japanese transport ships (hellships), suffered aerial bombardment from the Allies. Among some 150 prisoners rescued, about 60 were British POWs from Thailand, including men from the Royal Corps of Signals. Interest in their accounts was intense. The War Office planned to debrief each survivor to try to ascertain the fates of the 40,000 British troops missing in the Far East. Phyllis, thinking about Barry’s men, contacted the War Office. She realised the immensity of their task in finding out about the thousands of missing men from the few rescued individuals. 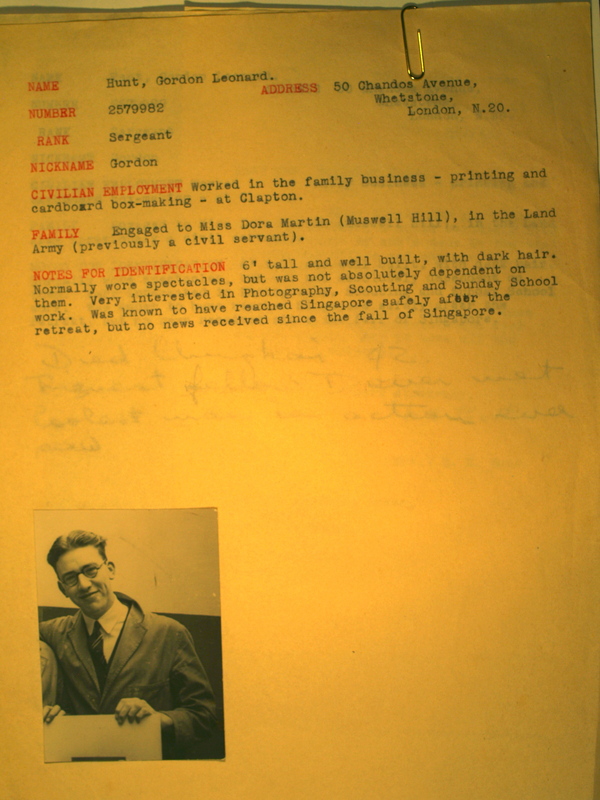 With the help of Queenie, the wife of Lieutenant Robert Garrod, she decided to compile a dossier with personal details and if possible photographs of the men in 27 Line Section for use in the debriefing sessions. She wrote to relatives the replies flooded in. Dear Mrs Baker,… it does certainly help to know that someone is personally doing their best for us. … Your heart must ache many a time like mine and we can only pray for strength to bear it. I am enclosing a snap of my husband [George] taken in Malaya soon after they arrived there, I have marked my man with a cross. He is of average height about 5’5” and of a slim build. His hair is medium brown and blue eyes. The only prominent feature is his nose, which is rather big. In civilian life my husband was employed at John Walton’s Bleach-works, a firm which belongs to Tootal, Broadhurst, Lee, Co. Ltd., but which always goes under that name. His dept at that time was Anti-Crease, you will remember Tootals Products are famed for their crease resisting properties, that was a part of his job, treating the material to be crease resisting. Dear Madam I am writing on behalf of my sister Mrs Bamford as her and her husband is no scolar and I have to do all the writing for them, now in regards to her son William Bamford which is a prisoner his Mother had a card from him last July 1944 to say he was alright working with pay … as far as we know he had no nick name just Willie he did not speak very clear the last time we seen him but he had false teeth before he went oversea but we did not have the pleasure of seeing him with them in before he went away, … now I do hope and trust you may be able to send his mother some good news concerning her son as he is their only child and they are just living for their boy. Sometimes the information was lost in an outpouring from desperate relatives. He is my Grandson and I brought him up from a Baby having lost his mother and father. and unfortunately I lost my Husband so I was forced to put him and his brother into the National Childrens Home and he had just finished serving his time at the printing Trade, when he was called up. so I don’t think I have seen him for about 3 1/2 years. in the first place he was sent to Malaya, and no doubt you know what happened their, when the Japanese got their. So having received that card at Exmas it is a little bit assuring don’t you think so, although they are such a long time before they reach you, one never knows as they are not dated, as their is a person who lives close by me, and I believe her Husband is in Siam well he wrote her a card in May and she has only just received it. But I must tell you that I send him a Japanese P.C. one a fortnight and I address it as this. A.H. Newton 2361041. Signalman, British. P.OW. Sandaka. Borneo, and I also have to put my address, but of course whether he receives them or not that is another matter, but it is not for want of trying for I do my best. and occasionally I write to the Red Cross in fact I sent to them at Christmas asking them to put a message of 10 words through for me so you see I am not backward in doing all I possibly can to try and let him hear from me. 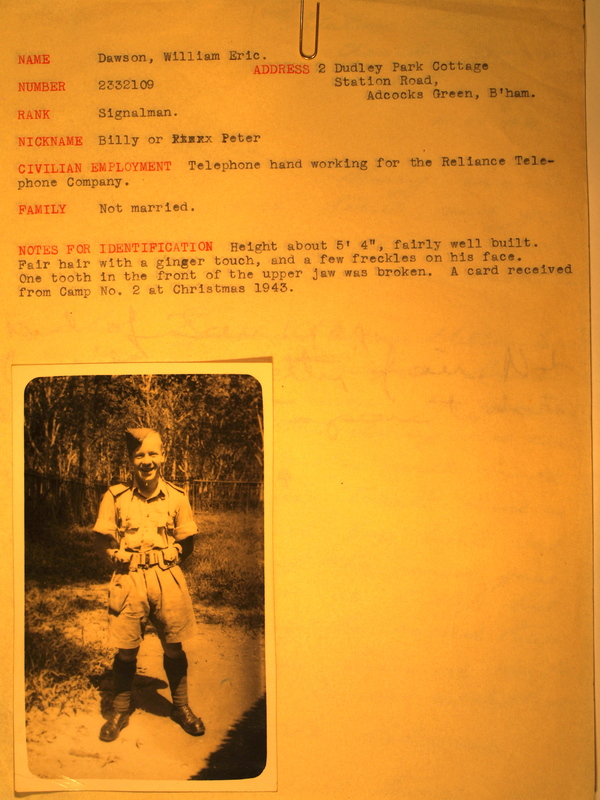 Phyllis extracted all the information from the letters and made a page for each man (including many not on 27 Line Section). 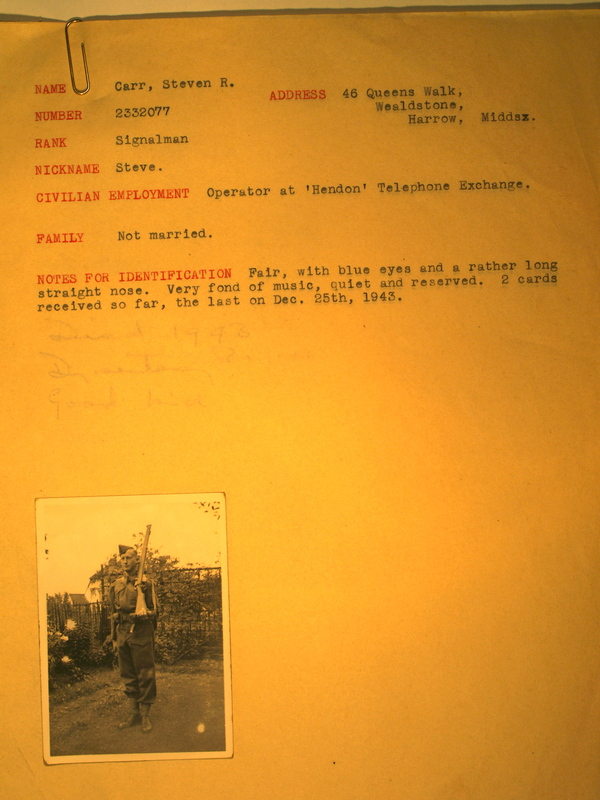 Finally, on 12 January 1945, Phyllis went to the War Office and handed in her dossier to a Mr Rogers. He did not know this at the time, but he was going to hear a lot more of Phyllis between now and late 1945. More pages from the dossier. 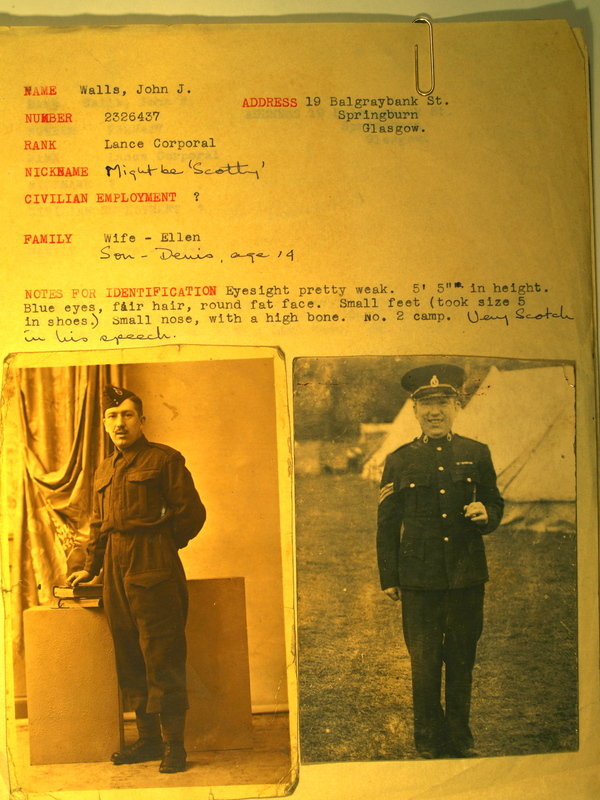 This entry was posted in POWs, Writing notes and tagged Far East POWs, hellships, Hofoku Maru, Researching FEPOW History, Royal Corps of Signals, Thailand, War Office by hilarycustancegreen. Bookmark the permalink. Who’s the little baby in your father’s arms? Yup, my big brother. Every move he made as a baby is described in my mother’s long letters to my father in 1942 and 1943, before they were reduced to 25 words. These are some precious artefacts. I just could not believe my eyes when I saw you posted them! 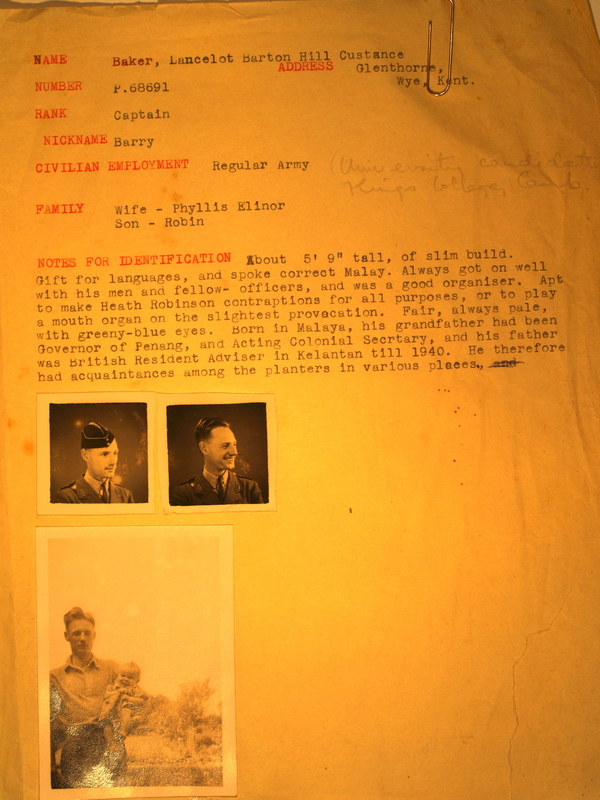 They are in a box file, deep in an archive in a well-guarded military museum, in the middle of the country. Few if any people will ever see them if I don’t make their existence public. One of the best posts I have read. Thanks, there’s more to the War Office story, but I shall return to the men in Thailand first. This is very interesting and I am troubled by a thought – you are accumulating so much information, so much detail, I cannot imagine how difficult a task it will be to structure it into a book. The book is already done… though I revise constantly. Yes, it was difficult to structure, but I hung on to the idea of making it into a chronological story. This has meant moving between England and the Far East, but at least the letters are in date order and the events in the Far East can be read at the same time. I have, too, on advice from friends, cut a lot of the material from my mother and grandparents’ letters, so the manuscript is under 100,000 words. We never see the actions of all these POW families, they are assumed to be passive bystanders. My mother must have spent so much of her time typing circular and personal letters. No photocopying then and carbons only made a few copies. She had addresses for relatives of about 58 of the 68 men sometimes there would be a mother, a wife and a fiancée to write to. I am still amazed… The inserts are poignant. I have (copies of) a couple of hundred letters to my mother. Many of them are very simple and formal, but there are so many heartbreaking and heartwarming ones as well. I can only fit a selection in the book (though I am using most of the ones from the men who came home), but I do want researchers to be able to find them. I am amazed by all of your mother’s work and yours to keep this for further generations! It shows how countries were ill-prepared for a war of aggression. Wow, quite the effort and a fascinating story. Your mother sounds like an amazing woman. Peggy’s dad was a hump pilot. He crashed in the jungle and was assumed MIA or a POW. Peg’s mom goth the message he had walked out of the jungle– after she got the message he was MIA. I had to look up hump pilots, I confess. I gather they started by flying over the Himalayas! Am I right in thinking that Peggy’s dad came down in Burma – seriously impenetrable jungle? Heartbreaking. Amazing pieces of history.